Thandai is the most popular North indian drink served during the festival time especially on holi. This is made with almonds and with little indian spices which taste sweet & spicy. It is really good & refreshing during the hot summer time. This is normally served very cold or by adding crushed ice cubes to drink instantly. 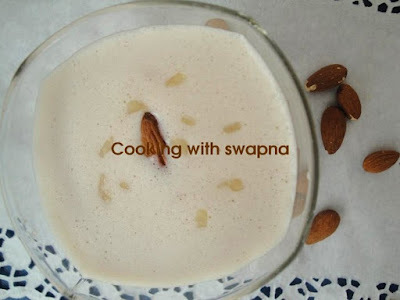 Addition of almond & rose water makes the drink rich, tasty & healthy. Almonds r good for the skin. Thandai is perfect for kids tooo & sure they will ask for the second cup. Soak the almonds in the water for atleast 2 hrs. Peel off the skin & grind them with 3/4 cup of water. Pour the water little at time. Meanwhile, grind the poppy seeds, peppercorns and cardomon together. Keep aside. Now mix the above powder with the almond paste & blend them together. Finally mix the milk and sugar. Blend all together for 2 to 3 min. 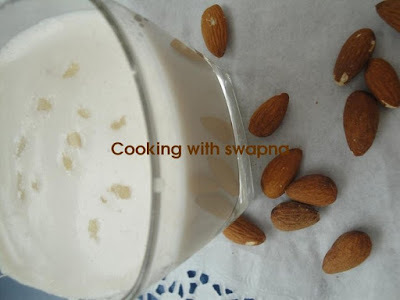 Strain the almond drink & add 1 tbsp of rose water. Garnish it with saffron or with almond pieces. Serve them with the crushed ice cubes. Nice creamy rich drink never knew that it was called thandai... nice pics!!! Nice drink... with almonds flavour.. This my favorite drink. Love to have it quite often. YUM!